A classic close-up effect, Disc Escape is now available in this exquisite brass finish sure to last a lifetime. 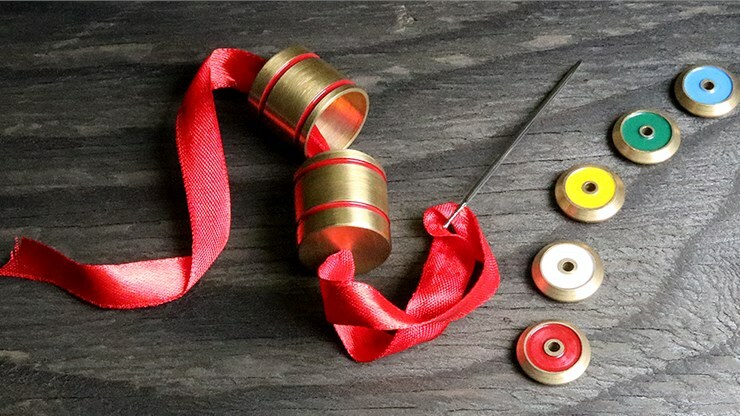 For those unfamiliar with the premise, you show five solid brass discs enameled in five different colours and a tube just large enough to hold the discs. All of the discs as well as the tube have a hole in their centres for a cord to be threaded through. A spectator freely selects any disc, no force. The discs are then placed into the tube, which is then capped. A cord is threaded through the holes in the discs and the tube and a spectator is asked to hold both ends of the cord, leaving the tube suspended from the centre. You then open the tube by removing the cap and all the discs are seeing threaded on the string; all except one, which falls to the table. Impossibly, it is the colour the spectator selected in the beginning. The spectators can then examine everything. Your purchase comes with all the props you need to perform this classic and mind-boggling effect, along with full instructions.